Annie Finch is a poet and a witch—and considers them to be the same thing. 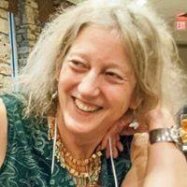 Annie speaks and teaches on women's empowerment, poetry and poetic form, and earth-based spirituality, and she performs both poetry and ritual. Her many publications include books on poetic craft, writings on spirituality, the feminist epic Among the Goddesses, and the poetry collections Eve, Calendars, and Spells. Her poetry has appeared onstage at Carnegie Hall and in The Penguin Anthology of Twentieth-Century American Poetry. A graduate of Yale with a Ph.D. from Stanford, Annie has received the Sarasvati Award for Poetry from the Association for the Study of Women and Mythology and the Robert Fitzgerald Award for a lifetime's contribution to the art and craft of Versification. She teaches in the low-residency M.F.A. program in creative writing at St. Francis College and offers talks, rituals, and workshops at spiritual gatherings, poetry conferences, and women’s events.